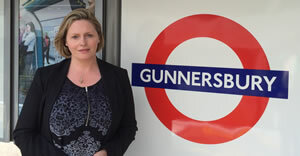 Local MP Mary Macleod has urged Hounslow Council to look at ways it can support much needed improvements to Gunnersbury Station. She suggested that the Council could use S106 funds to help with the cost of upgrading the station, which is used by thousands of employees of Chiswick Business Park on a daily basis and experiences congestion, particularly at rush-hour. Last month, Network Rail said it would commit to supporting improvements at Gunnersbury Station and has agreed to ask an architect to look at options for improvement. The Gunnersbury Station Action Team, which was set up to focus on improving safety, has advocated introducing clearer signage and reconfiguring the platform in the hope of reducing congestion on the staircase. Mary commented; "With the support of Hounslow Council, via Section 106 funding, improvements to the station could move closer to becoming a reality. Some Section 106 funding has already been used for various improvements, but targeted funding will likely be needed before work on the station can begin. Mary added: “The Gunnersbury Station Action Team has made real progress in identifying what needs to change at the station, but we now need Hounslow Council to support the plan too. I have pressed the Council to seriously look at providing more funding for Gunnersbury Station, so that we can begin improving it as soon as possible for the thousands of local people and commuters who use it every day. Once the Council agree with us that Gunnersbury Station is no longer fit for purpose, I hope they will want to support our plans too”.